Figure 50-48 Trichophyton rubrum showing numerous pyrifonn microconidta bome singly on hyphae (750x). Rgure 50-49 Trichophyton mentagrophytes showing numerous microconidia in grapelike clusters (A). There are also several thin-walled macroconidia present (B) 500x. 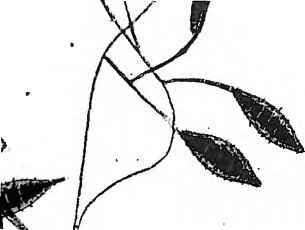 Figure 50-50 Hair perforation by T. mentagrophytes. Wedge-shaped areas (arrow) illustrate hair perforation (lOOx). 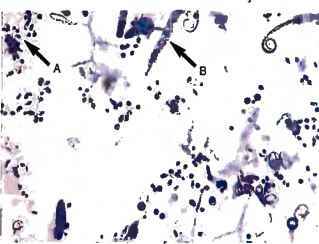 Figure 50-51 Trichophyton tonsurans showing numerous microconidia (A) that are bome singly or in clusters. A single macroconidium (B) (rare) is also present (600x). Trichophyton verrucosum grows slowly (14 to 30 days), and growth is enhanced at 35° to 37° C and also on media enriched with thiamine and inositol. Trichophyton verrucosum may be suspected when slowly growing colonies appear to embed themselves into the agar surface. Kane and Smitka64 described a medium for the early detection and identification of T. verrucosum. The ingredients for this medium are 4% casein and 0.5% yeast extract. The organism is recognized by its early hydrolysis of casein and very slow growth rate. 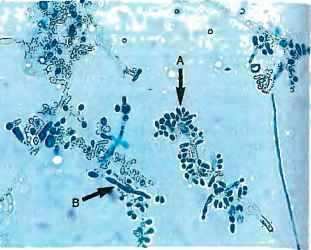 Chains of chlamydoconidia are formed regularly at 37° C. The early detection of hydrolysis, formation of characteristic chains of chlamydoconidia, and the restrictive slow growth rate of T. verrucosum differentiate it from T. schoenleinii, another slowly growing organism. Colonies are small, heaped, and folded, occasionally flat and disk-shaped. At first they are glabrous and waxy, with a short aerial mycelium. Colonies range from gray and waxlike to a bright ochre. The reverse of the colony is most often nonpigmented but may be yellow. Microscopically, chlamydoconidia in chains and antler hyphae may be the only structures observed microscopically in cultures of T. verrucosum (see Figures 50-32 and 50-38). Chlamydoconidia may be abundant at 35° to 37° C. Microconidia may be produced by some cultures if the medium is enriched with yeast extract or a vitamin (Figure 50-52). Conidia, when present, are borne laterally from the hyphae and are large and davate. 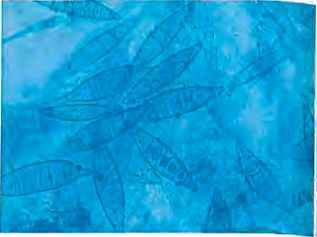 Macroconidia are rarely formed, vary considerably in size and shape, and are referred to as "rat tail" in appearance. Figure 50-52 Trichophyton verrucosum, showing microconidia, which are rarely seen (500x). pecia. Infections are common among members of the same family. A distinctive invasion of the infected hair, the favic type, is demonstrated by the presence of large, inverted cones of hyphae and arthroconidia at the base of the hair follicle and branching hyphae throughout the length of the hair shaft. Longitudinal tunnels or empty spaces appear in the hair shaft where the hyphae have disintegrated. In calcofluor white or potassium hydroxide preparations, these tunnels are readily filled with fluid; air bubbles may also be seen in these tunnels. Trichophyton schoenleinii is a slowly growing organism (30 days or longer) and produces a white to light gray colony that has a waxy surface. Colonies have an irregular border that consists mostly of submerged hyphae and that tends to crack the agar. The surface of the colony is usually nonpigmented or tan, furrowed, and irregularly folded. The reverse side of the colony is usually tan or nonpigmented. Microscopically, conidia are not formed commonly. The hyphae tend to become knobby and club-shaped at the terminal ends, with the production of many short lateral and terminal branches (Figure 50-53). Chlamydoconidia are generally numerous. All strains of I schoenleinii may be grown in a vitamin-free medium and grow equally well at room temperature or at 35° to 37° C.
Trichophyton violaceum produces an infection of the scalp and body and is seen primarily in persons living in the Mediterranean region, the Middle and Far East, and Africa, Hair invasion is of the endothrix type; the typical "black dot" type of tinea capitis is observed clinically. 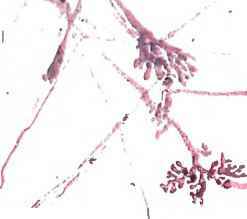 Direct microscopic examination of the calcofluor white or potassium hydroxide preparation of the nonfluo-rescing hairs shows dark, thick hairs filled with masses of arthroconidia arranged in chains, similar to those seen in T. tonsurans infections. Figure 50-53 Trichophyton schoenleinii, showing swollen hyphal tips with lateral and terminal branching (favic chandeliers). Microconidia and macroconidia are absent (500x). Figure 50-54 Large, rough-walled macroconidia of M. amis (430x). (warty), violet to purple, and waxy in consistency. Colonies may often be described as being "port wine" in color. The reverse side of the colony is purple or nonpigmented. Older cultures may develop a velvety area of mycelium and sometimes lose their pigmentation. 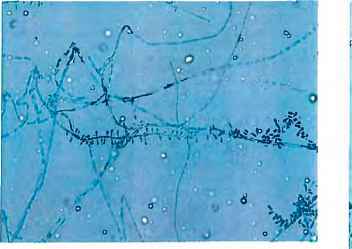 Microscopically, microconidia and macroconidia are generally not present; only sterile, distorted hyphae and chlamydoconidia are found. In some instances, however, swollen hyphae that contain cytoplasmic granules may be seen. The growth of T. violaceum is enhanced on media containing thiamine. (3 to 7 Jim) and dub-shaped and are bome on the hyphae, either laterally or on short conidiophores. Cultures of Microsporum develop either rapidly or slowly (5 to 14 days) and produce aerial hyphae that may be velvety, powdery, glabrous, or cottony, varying in color from whitish, buff, to a cinnamon brown, with varying shades on the reverse side of the colony. Microsporum audouinii was, in past years, the most important cause of epidemic tinea capitis among schoolchildren in the United States. This organism is anthro-pophilic and is spread directly by means of infected hairs on hats, caps, upholstery, combs, or barber clippers. Tlie majority of infections are chronic; some heal spontaneously, whereas others may persist for several years. Infected hair shafts fluoresce yellow-green using a Wood's lamp. Colonies of M. audouinii generally grow more slowly than other members of the genus Microsporum (10 to 21 days), and they produce a velvety aerial mycelium that is colorless to light gray to tan. The reverse side often appears salmon-pink to reddish brown. Colonies of M. audouinii do not usually sporulate in culture. The addition of yeast extract may stimulate growth and the production of macroconidia in some instances. Most commonly, atypical vegetative forms such as terminal chlamydoconidia and antler and racquet hyphae are the only clues to the identification of this organism. It is common to identify M. audouinii by exclusion of all the other dermatophytes as a cause of infection. Microsporum canis is primarily a pathogen of animals (zoophilic); it is the most common cause of ringworm infection in dogs and cats in the United States. Children and adults acquire the disease through contact with infected animals, particularly puppies and kittens, although human-to-human transfer has been reported. Hairs infected with M. canis fluoresce a bright yellow-green using a Wood's lamp, which is a useful tool for screening pets as possible sources of human infection. Direct examination of a calcofluor white or potassium hydroxide preparation of infected hairs reveals small spores (2 to 3 pm) outside the hair. Culture must be performed to provide the spedfic identification. 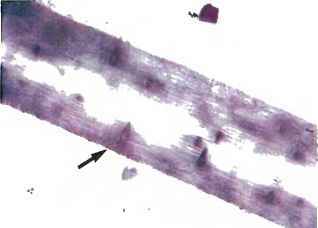 Figure 50-55 Microsporum canis, showing several spindle-shaped, thick-walled, mult ¡celled macroconidia (500x). with spiny (echinulate) projections on their surfaces, Microconidia are usually few in number; however, large numbers may occasionally be seen. Microsporum gypseum, a free-living organism of the soil (geophilic) that only rarely causes human or animal infection, may be occasionally seen in the clinical laboratory. Infected hairs generally do not fluoresce using a Wood's lamp. However, microscopic examinaL tion of the infected hairs shows them to be irregularly covered with clusters of spores (5 to 8 pm), some in chains. These arthroconidia of the ectothrix type are considerably larger than those of other Microsporum speries. Microsporum gypseum grows rapidly as a flat, irregularly fringed colony with a coarse, powdery surface that appears to be buff or cinnamon color. 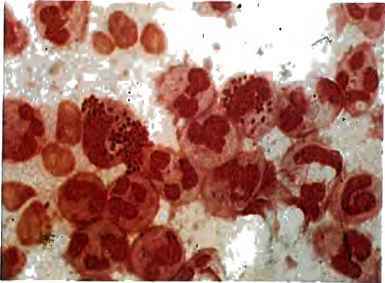 The under» side of the colony is conspicuously orange to brownish Microscopically, macroconidia are seen in large numbers and are characteristically large, ellipsoidal, have rounded ends, and are multisegmented (three to nine) with echinulated surfaces (Figure 50-56). Although they are spindle-shaped, these macroconidia are not as pointe4 at the distal ends as those of M. canis. The appearance of the colonial and microscopic morphologic features is suffident to make the distinction between M. gypseum and M. canis. Figure 50-56 Microsporumgypseum showing ellipsoidal, multicelled macroconidia (750x). Ry, and growth appears as an olive-green to khaki color, with the periphery surrounded by a dull orange-brown color. After several weeks, colonies develop a cottony white aerial mycelium that completely overgrows the colony and is sterile, and remains so, even after subculture. Microscopically, numerous smooth, thin-walled, club-shaped, multiseptate (2 to 4 pm) macroconidia are seen (Figure 50-57). They are rounded at the tip and are bome singly on a conidiophore or in groups of two or three. Microconidia are absent, spiral hyphae are rare, and chlamydoconidia are usually numerous. 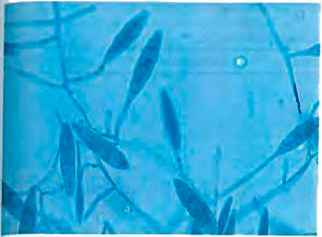 The absence of microconidia is useful in differentiating this organism from Trichophyton species, whereas the morphology of the macroconidia (smooth and thin-walled) is useful in differentiating it from ■Microsporum species. Serology is not useful for the diagnosis of disease caused by dermatophytes.